Home » Destinations » Puerto Rico: No passport required! 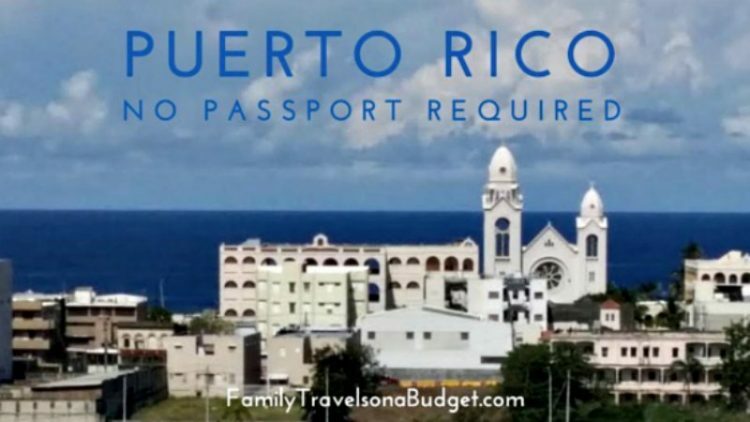 Puerto Rico: No passport required! This post is sponsored by See Puerto Rico. A couple months ago, my husband and I celebrated our 25th anniversary with a cruise that departed out of Puerto Rico. We flew into San Juan, spent the night and enjoyed a relaxed morning before heading over to the cruise terminal. We knew from almost the moment we landed on this beautiful island that our next trip to Puerto Rico would have to be longer. Since we have kids at home and had grandma watching over them, we couldn’t add on to our cruise vacation. We hope to have her volunteer to watch them again. Now that we’ve had a little taste of this tropical paradise, we plan to vacation there next time. Puerto Rico: Did you know? Puerto Rico has 270 miles of coastline, which means there is plenty of space for snorkeling, swimming, kayaking, sailing, kite surfing (on my bucket list) and more! El Yunque National Forest is the only rainforest in the US National Forest system, featuring tree-size ferns and a variety of tropical birds, accessible by hiking or kayaking through the forest. San Juan is a history buff’s paradise with great places to visit like Casa Blanca, Castillo San Felipe del Morro and Castillo San Cristóbal, with incredible views. The magnificent Camuy River Cave Park in Northwestern Puerto Rico, home to the third largest underground river cavern system in the world, provides a memorable experience for the adventurer. The Puerto Rican food scene has something for everyone, from coffee plantation tours and tastings to food tours throughout San Juan and, of course, rum tours and tastings. With so much to see and do, Puerto Rico is a 5-star vacation destination! Even more, this tropical island is easy to reach — no passport required, no foreign currency exchange needed and airfare is reasonable. Rob and I flew here cheaper than we can fly to Miami! Since we are adventurous and foodie types, our next trip to Puerto Rico will include a day exploring the Camuy Caverns and surrounding area, a day to explore El Yunque and “hunt” for bird photos, and a relaxing day on a beach (it can’t be all hard work — right?) Rob has already researched a few restaurants, while I found a great coffee tour to get one day started. Certainly, we will never visit San Juan again without making time for a rum factory tour and tasting! I want to visit PR. Ever since I got my passport I have been trying to get more stamps but I keep forgetting u dont need a passport for PR. MAybe it will be one of my future trips with friends who dont have one. I’m almost sure we’d visit San Juan if we were to visit Puerto Rico. My husband and son are both history buffs. I’m not but I’d enjoy the scenery enough to tag along. I am yet to visit Puerto rico but it’s actually on my list of dream honeymoon vacations, I hope soon in the future when the OH asks me to marry him we can vacation there. I want to see the blue coastline for myself and not other people’s pictures lol. I really need to go to Puerto Rico, it’s amazing! I’ve heard so much about it and it sounds wonderful. I knew that Puerto Rico was one of the US territories, but I didn’t realize that meant you didn’t need a passport! I would love, love, love to go on a coffee tour, so I hope to read about that soon! Of course, we’re in the same place as you for travel– being reliant on finding someone to watch our little ones. Hopefully one of our moms will volunteer soon, and we can enjoy a trip! How did I not know you didn’t need a passport to visit Puerto Rico?? I need to plan a vacation getaway for myself soon and this looks like the perfect destination. I love the ocean I have a feeling that’s were I would be the whole time, looks beautiful! I went to PR a few years back and loved it. I love hiking in the forest, and one day we chartered a boat to take us out to a private island and it was FANTASTIC. There was no one around the and the beach was magnificent. I would love to go again soon! Ooooh! That sounds lovely. Private islands are such a fun part of the Caribbean! I have been wishing for a warm destination and really didn’t have Puerto Rico on my list. After reading your blog post, I definitely have it on my list now. Sounds like it would be luxurious without being a hassle. Exactly! The airport is easy to navigate. Taxi fares are well-regulated and the drivers are courteous. They have every hotel chain and a ton of boutique and niche places, too. It’s fabulous! Puerto Rico is on my bucket list. My husband and I have talked about going there a few times and hopefully we make it one of these days. Tropical designations are my favorite places to vacation too! I love to just chill on the beach not needing a passport to visit is even better! I think my husband and I may need to go down for a visit. My husband visited about 20 years ago. I think it would be great to visit Puerto Rico as a family now. I know someone who just got married in PR in November. It looked beautiful. I am one for the beach and coffee so this sounds like the perfect place for me! I’d love to go on a coffee tasting tour. I always forget that you don’t need a passport to visit Puerto Rico! I need to convince my husband to take us on vacation there! We both don’t have passports so it’s the ideal location! We loved Puerto Rico when we visited years ago. It may be time for another trip! Wow, you could really have a life-changing adventure in Puerto Rico. I’d love to spend some time kayaking and checking out the flora and fauna. I’d make sure to try out some local cuisine too though! Kayaking is one of our favorite pastimes. Let’s head to Puerto Rico and see what we can find! What I really love is that you don’t need a passport. Sometimes getting one can be overwhelming to people (not speaking from personal experience or anything… or am I?) It’s really an overlooked destination that is so accessible to Americans. There is SO much to see and do! I remember when we first got our passports. It was overwhelming and exciting, definitely a bit intimidating. I have always wanted to visit Puerto Rico. It seems like such a beautiful place. I think if I went, I wouldn’t want to come back. That’s probably an accurate assessment! We didn’t want to come home after our cruise! I would love to visit Puerto Rico someday! It’s such a different place from where I live in Maine! lol I’d love to see the El Yunque National Forest in person! Me too, Jessica! That’s why it’s on my list. Want to go with me? I have heard wonderful things about Puerto Rico. I personally have never been before but my husband has and he says it’s stunning. Puerto Rico looks so beautiful. I would love to visit and wander the coastline just taking it all in. That’s what we did this trip. 🙂 It was nice, but it made us want to go back soon to do more. My grandparents went to Puerto Rico years ago and LOVED it! You mentioned you went to a Rum factory? Now that would have been awesome! Love this! Visiting Puerto Rico is on our travel list. We’re hoping to go in the next year or two. I was surprised at how affordable the air travel was. We will definitely go back for the big trip soon. Anywhere warm and sandy is the place to be this time of year. No sense shoveling snow when you’re on vacation! I agree. Leave that to the ski resorts, right? Definitely fun to dream about some place warm and beachy this time of year. !